Trust is an essential element of a work relationship. Trust may take time to develop but easy to lose. Examples of trust include having faith that a colleague will complete his or her part of an assigned project or relying on a supervisor's promise of a promotion by a specific date. Betrayal is a loss of trust that can stem from subtle actions, like telling a white lie, to large scandals such as embezzlement. Feelings of betrayal can occur when there is dishonesty or perceived dishonesty and can coincide with feelings of disappointment or unmet expectations. Examples of betrayal include layoffs in a department after promises of job security, and belittling a co-worker. A betrayal of trust, minor or unintentional, can diminish employee confidence, alienate workers from their peers, add communication roadblocks, affect decision-making, and diminish worker creativity. Failure to address and resolve a betrayal promotes a culture of distrust that can lead to greater betrayals. Trust elevates levels of commitment and sustains effort and productivity without the need for management control. Studies show that trust-based working relationships give organizations a competitive advantage. A leader's level of trust is contingent upon the employee's perceptions of the leader's integrity, benevolence, and ability. Trust requires mutual commitment. Trust is built through honesty, integrity and consistency in relationships. Although it requires mutual commitment and effort, there are several ways individuals can act on their own to initiate trust. - Attend to what is happening in the work environment. Listen and learn what caused a broken trust relationship, and the impact on those affected. - Allow feelings to surface. When people are in pain, they need to be heard and given support. Sometimes just talking with a trusted friend or colleague is good therapy; other times professional assistance may be required. - Take responsibility for betrayal of trust in a given situation, then list ways you can change your behavior in a subsequent happening. - Behave consistently and predictably. Ensure that your words and subsequent actions are congruent, and honor commitments. Integrity is reinforced to the extent that you do what you say you will do. - Perform competently. Continuously strive to demonstrate excellence in performing your responsibilities. - Communicate face-to-face, if feasible. Studies suggest that perpetual electronic communication such as emails can make workers feel disconnected. This suggests visual cues and personal and group meetings are important for building trust. - Communicate accurately, openly, and transparently. Be explicit and direct about your intentions. State what you need or expect. Don't assume others know what to do. Tactfully air problems and seek win-win resolutions. When engaged in an ongoing project with others, communicate progress. - Show respect and concern for others. Demonstrate sensitivity to peoples' needs, desires, and interests. Be genuine, friendly. Understand what trust means in different cultures. Get to know people better by engaging in social activities. This helps to strengthen common qualities and minimize false stereotypes. - Forgive. This helps to free you from anger, bitterness, and resentment. Let go and move on. - Write a letter to someone you distrust. List your reasons for not trusting. Share feelings and irrational beliefs that block trust, and ask the person to help you resolve the issue. Tell the person what you're willing to do (and not do) to improve a given situation. When you've completed the letter, send it, save it or tear it up. Note what you've learned and how you can apply the knowledge to a work situation. - Create a healthy work environment. Minimize competition and encourage cooperation and teamwork. Solicit input and share decision making. Propose joint products, services and activities that define common goals. 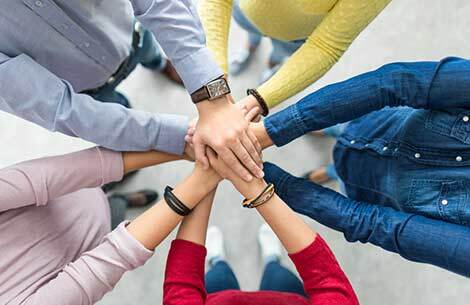 Working toward the collective achievement of goals fosters a feeling of commonality that can strengthen a shared identity, reduce divisiveness and encourage teamwork. So does engaging in discussion and actions that build a sense of "we" rather than "me." Recognize others' contributions and demonstrate confidence in their abilities. Share credit. - List things you can do to build trust with an associate or acquaintance you currently mistrust. Share your ideas with a trusted friend or co-worker. - Questers Dare to Change Your Job and Life offers additional suggestions for building trust.